I'm planning on doing several different manicures during the month of October and I decided I should get a head start to try out some different looks! The first one I decided on was a Halloween colored glitter gradient with a stamped accent nail. For the base I used Essie "Orange it's Obvious" and then dabbed on L.A. Girl "Uninhibited" as a gradient on the tips. For my accent nail, I used Sally Hansen "Black Out" as the base and stamped on the spiderweb pattern from the DRK-A jumbo plate with Sally Hansen "White On." I think it turned out pretty cute! 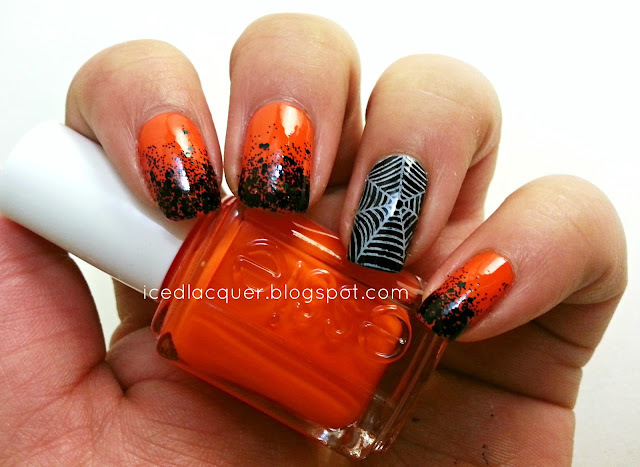 Do you have any Halloween manicures you plan on trying before the end of the month? There are so many more I want to try! this is great!!! Beautiful gradient!